Retinopathy of prematurity (ROP) is one of the most common causes of preventable blindness in children. In spite of the availability of various treatment options, and favorable results with timely intervention, many infants present to the ophthalmologists in the advanced end stage of the disease due to lack of awareness especially in the developing nations. This blinding or Stage 5 of ROP presents with total retinal detachment and has to be managed surgically. The surgical techniques for Stage 5 ROP are unique and demanding. The successful anatomical results after surgery are only seen in 20%–50% of cases. In spite of a successful anatomical result, the visual outcome may be slow and limited. The use of newer pharmacological adjuncts has shown promising results. Because of heterogeneity of presentation of the disease severity, a genetic predisposition has also been proposed. A concerted effort from the pediatricians, ophthalmologists, and healthcare workers is required to establish effective screening and treatment guidelines to prevent blindness due to ROP. Till then surgical management has to be done. Parents must be educated regarding the limited visual benefits of surgery and the need for prolonged follow-up. This review gives a comprehensive overview of the pathogenesis, clinical aspects, surgical interventions, and their outcomes and future prospects of Stage 5 ROP. Retinopathy of prematurity (ROP) is a vasoproliferative disease of the premature infants characterized by abnormal vascularization at the junction of the vascular and avascular retina. If not diagnosed in time, it may result in significant visual impairment and in severe cases, such as Stage 5 ROP, it can lead to blindness-causing extreme distress to the children and their families. The first description of the disease was given in the 1940s when the end stage of ROP was termed as “retrolental fibroplasia.” Since then, two epidemics of ROP have been witnessed. The “ first epidemic” in Europe and North America saw surge in cases of ROP due to the administration of excessive supplemental oxygen therapy. Following restriction in the usage of oxygen, there was a marked reduction in these epidemic proportions. With the advancement in neonatal care in the early 1970s, the survival rate of low-birth-weight (LBW) infants increased substantially resulting once again in resurgence in the number of ROP cases resulting in the second epidemic. The introduction of better neonatal intensive care units (NICUs) and availability of effective treatment in the form of cryotherapy and laser photocoagulation resulted in a decline in this “second epidemic” of ROP in developed countries. In developing countries, ROP still remains an important cause for blindness in children. Better survival rates of preterm babies and the lack of screening guidelines and effective healthcare program to regulate oxygen are now leading to a “third epidemic” in the middle- and lower-income countries in Latin America and Asia. Reducing severe visual impairment in children in these countries is one of the major targets of the global prevention of blindness initiative of the VISION 2020 the Right to Sight Program. The study was conducted in accordance with the Declaration of Helsinki and was approved by the Institutional Review Board. We performed a comprehensive literature search of all the articles related to Stage 5 ROP and published until May 2018 using PubMed and Google Scholar database. Maximum possible relevant articles related to this field were included to provide an overview of the pathogenesis, diagnosis, management, surgical outcomes, complications, and future prospects of the Stage 5 ROP. We have summarized the surgical techniques according to our experience as well to provide a wholesome picture of the current perspectives in Stage 5 ROP. The spectrum of the disease may vary from very mild cases that show spontaneous resolution to very severe cases that may cause complete bilateral blindness within the 1st year of life. In 1984, the extent of ROP was described in three zones, five stages, and the presence or absence of plus disease as per the International Classification of ROP. The zones are described as three anterior-posterior zones as shown in [Figure 1]. 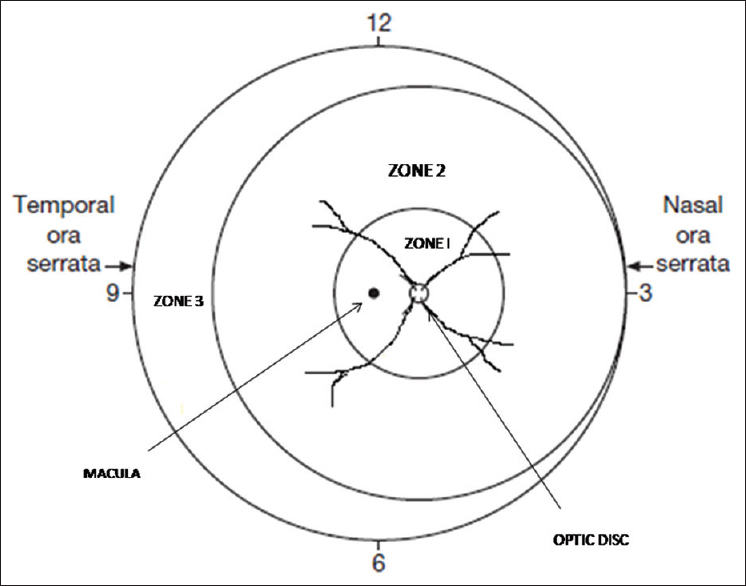 Zone I is defined as a circle, centered on the disc, whose radius is twice the distance from the disc to the macula; Zone II extends from the edge of Zone I to the nasal ora serrata; and Zone III is the remaining temporal crescent of retina anterior to Zone II. As the disease evolves, five stages of increasing severity have been described. Stage 1 is that of a flat, white demarcation line present within the plane of the retina, separating the anterior avascular retina from the vascularized posterior retina. Stage 2 is that of a ridge which is nothing; but, the demarcation line which now becomes more prominent and increases in height to extend above the plane of the retina. Stage 3 is the presence of extraretinal fibrovascular proliferation in 1–12 clock hours in addition to the presence of the ridge. Contraction of this fibrovascular proliferation at the ridge can result in partial retinal detachment (RD) which is included in Stage 4 with Stage 4a not involving the macula and Stage 4b involving the macula. Stage 5 is when this cicatricial process results in complete RD which is usually tractional; the peripheral avascular retina may, however, remain attached especially if prior laser has been done. In 2008, Gilbert estimated around 50,000 children aged up to 15 years were blind due to ROP. However, later Blencowe et al. stated this to be an underestimation and reported up to 32,200 infants becoming blind because of ROP in 1 year (2010). Solebo et al. in a recent update on childhood blindness estimated about 14 million blind children worldwide; ROP and cataract being the most common causes of preventable blindness. The prevalence of ROP in a nation not only depends on the number of premature births but also on the survival rates of the very preterm babies, neonatal care, and effective screening and treatment strategies for the prevention of ROP available. In developed high-income countries such as the United States of America and the United Kingdom, ROP is seen in very LBW infants with <28 weeks' gestation where in spite of the availability of effective ROP screening and treatment, infants progress to advanced stages because of the severity of the disease; prevalence of ROP in these countries is between 10 and 20 per 100,000 live births. This is in contrast to developing and low-income countries like India where up to 86% of the infants with Stage 5 ROP may have never had a screening for ROP, highlighting the lack of awareness, and targeted screening strategies. In other developing countries also such as China, Malaysia, and Taiwan where survival rates are increasing and screening protocols not yet streamlined, the prevalence rates are high.,, In countries like those in Africa because of very high mortality rate, the prevalence of ROP would be <10 per 100,000 live births. Lower birth weight, lower gestational age, presence of respiratory distress, sepsis and history of blood transfusion, and supplemental oxygen are well-acknowledged risk factors for ROP.,, Duration of ventilation as well as oxygen saturation has been demonstrated to influence the severity of ROP., The supplemental therapeutic oxygen for prethreshold ROP trial did not show any influence of change in oxygen saturation on the progression of disease, once ROP has set in. Current guidelines suggest the implementation of the “Oxygen with Love” strategy for the prevention of ROP in NICUs. Retinal blood supply is from two sources as follows: the choroidal vessels (outer retinal layers) and the retinal vessels (inner retinal layers). Although the development of choroid is complete by 3 months of gestation, retinal vascular development is incomplete at birth in a premature child. Retinal growth starts at 16th week of gestation, reaching the nasal ora serrata by 32 weeks and temporal by 40 weeks. Hence, more the child is premature, larger is the area of avascularity. Two retinal vascular development processes have been recognized in the eye. (1) Vasculogenesis wherein the vessels develop de novo from the endothelial cells and (2) angiogenesis where the blood vessel formation occurs from preexisting vessels. While vasculogenesis forms the major retinal blood vessels, the angiogenesis forms the capillary plexus in the deeper and peripheral retina. The process of angiogenesis is vascular endothelial growth factor (VEGF) dependent., Both the processes are essential for normal retinal vascular development. In utero, there is low tissue oxygen, and the developing retina is in a state of physiologic hypoxia. The development of abnormal vasculature in ROP occurs in two phases. The initial phase of vaso-obliteration occurs in response to hyperoxia which occurs on exposure of the premature baby to environmental and supplemental oxygen necessary to treat associated conditions such as respiratory distress syndrome. The second phase occurs as a result of hypoxia due to increased metabolic demands of the maturing retina. This hypoxia results in increased VEGF resulting in vasoproliferation at the edge of the vascular retina. VEGF has been implicated as a major factor in the pathogenesis of ROP. Insulin-like growth factor in addition to VEGF has also been implicated. If not treated in time, proliferation of immature capillaries along with connective tissue starts at the junction of the avascular and vascular retina. These vasoproliferative cells also grow into the vitreous and contract resulting in traction on the retina., The vasoproliferative cells also grow along the collagen fibrils in vitreous toward the posterior capsule of the lens. With increasing traction, [Figure 2]a and [Figure 2]b the neurosensory retina detaches from the retinal pigment epithelium (RPE) resulting in tractional detachment with a concave configuration. The effect of this traction on vascular and avascular retina is different. The vascular retina cannot stretch beyond a limit and results in detachment of the retina., The peripheral avascular retina on the contrary can stretch significantly without getting detached., This results in the presence of a fold between the vascularized and avascular retina which is popularly known as the “peripheral trough,” a unique characteristic of Stage 5 RDs. Further contraction results in narrowing of this funnel-like RD. Varying degree of this contraction gives retinal funnel, the nomenclature of Open-Open (open anteriorly and posteriorly); Open-Close (open anteriorly and closed posteriorly); Close-Open (close anteriorly and open posteriorly); and Close-Close (both anterior- and posterior-closed funnel detachment). As proliferation continues, the fibrous tissue becomes more opaque resulting in white, dense membranes seen posterior to the lens giving Stage 5 ROP the name of retrolental fibroplasia (RLF). The assessment of visual function in children with Stage 5 ROP is challenging. Clarkson et al. have suggested that an attempt should be made to look for behavior to light in these children before the surgery. However, in children with bilateral RD, this can be extremely difficult. Visual-evoked potentials (VEP) have also been suggested in such cases to objectively determine the visual function. The VEPs should preferably be performed when the child is awake. Although in very uncooperative children, sedation may be necessary. The role of VEP in preterm infants remains controversial. As the proliferative tissue extends 360° behind the lens, the contraction of this RLF pushes the crystalline lens forward causing shallowing of the anterior chamber (AC), formation of posterior synechiae and anterior synechiae. This may also lead to angle-closure glaucoma. Anterior segment should be evaluated for the presence of anterior synechiae, posterior synechiae, depth of AC, and pupillary dilatation. Jabbour et al. reported the anterior segment findings of shallow AC, membrane over the pupil, and irregular pupil with posterior synechiae as significant anterior-segment findings associated with poor surgical outcome. Rarely, the RLF may not be very dense and may allow some view of the underlying retinal details. Most other times, the dense RLF precludes the examination of the posterior segment. Ultrasonography is useful in studying the configuration of RD and other associated features., The eye is assessed for the status of vitreous, retina, choroid, and axial length. The RD on B-scan should be assessed regarding configuration, presence of subretinal echoes, and location of peripheral retinal loops and cysts. The subretinal echoes can be due to the presence of serous fluid, hemorrhage, or cholesterol.,, Gopal et al. and Muslubas et al. have reported the incidence of anterior- and posterior-closed funnel configuration to be as high as 81% in eyes undergoing surgery for Stage 5 ROP. The presence of subretinal opacities was observed in 9%–47% eyes.,,,, These opacities have been associated with poor surgical outcomes. Axial length was found to be inversely related to the severity of Stage 5 ROP. Maidana et al. reported a reduction of axial length in 75% of the eyes with Stage 4 and Stage 5 ROP as compared to normal eyes. Various authors have reported the anterior retinal loops in 16% to as high as 72% of these eyes.,,, Although ultrasonographic findings may help in predicting anatomical success following surgery, it may be difficult to discern and differentiate the retinal details from the vitreous and retinal folds. Stage 5 ROP most commonly presents as “leukocoria” and needs to be differentiated from ocular tumors of childhood like retinoblastoma (RB). RB can also present with RD, although it is often exudative and has a convex surface as opposed to the concave surface seen in ROP. These tumors presenting with leukocoria are typically quite large and are easily picked up on ultrasound. Persistent fetal vasculature (PFV) can have a similar appearance to Stage 5 ROP but is usually unilateral. Other features associated with PFV include smaller size of the globe, peripheral pulled up prominent ciliary processes, and absence of a history of prematurity. Coats disease can also present as leukocoria but is also generally unilateral and has extensive subretinal lipid exudates with telangiectatic retinal blood vessels which are not typically seen in ROP. Severe cases of familial exudative vitreoretinopathy (FEVR), Norrie disease, incontinentia pigmenti also present with neovascularization, and total RD. The absence of history of prematurity can rule out ROP in these cases. Was popularized by Hirose et al. It involves trephination and removal of the corneal button followed by radial iridotomies at 6 and 12 o clock meridian, intracapsular lens extraction using a cryoprobe and dissection of the retrolental membranes in a peripheral to central fashion. Removal of the corneal button allows better visualization and removal of RLF “en block.” This is followed by resuturing of the corneal button using 10-0 nylon., Hirose et al. reported a success rate of up to 39% with this technique. This technique has the advantage of allowing two-hand dissection from a larger anterior incision; however, the maintenance of intraocular pressure (IOP) during surgery may be dificult, and there is a risk of corneal rejection postoperatively after resuturing the cornea. Due to this, the focus has gradually shifted to closed vitrectomy with or without lensectomy. This presentation is usually seen in severe cases of ROP which progress to total TRD despite peripheral retinal ablation. It is usually seen in Zone 1 or Zone 2 posterior ROP that have an open anterior and open posterior configuration of RD. As the lens is clear, lens-sparing vitrectomy (LSV) through the pars plicata is done because pars plana does not develop until 8–9 months of age., LSV involves making three ports through the pars plicata not more than 1.5 mm from the limbus. Preterm babies have much smaller eyes; hence, care has to be taken to direct the microvitreoretinal (MVR) blade toward the mid-vitreous cavity to avoid touching the lens. Furthermore, to avoid the much-elevated retina in these eyes, care must be taken to avoid going in completely with the MVR and resulting in a retinal touch or break. With the advent of microinsional vitrectomy system (MIVS), more and more surgeons prefer to do ROP surgeries also with MIVS due to the advantages of less surgical trauma, increased patient comfort, and early postoperative recovery. Gonzales et al. reported the successful use of 25G system in eyes with Stage 4 and Stage 5 disease. 25G vitrectomy in ROP allows better access to the retrolental space without causing lens touch and dissection in between retinal folds without causing retinal break formation. Before making the sclerotomies, a thorough examination of the peripheral retina is done to look for areas of peripheral retinal folds. Such areas are best avoided while making sclerotomies to prevent inadvertent retinal breaks. Combination instruments, such as infusion light pipe or infusion cannula with light pipe, can be used to allow bimanual dissection. The aim of the surgery is to relieve “ridge to ora,” “ridge to ridge,” and “ridge to the lens” traction membranes. Vitrectomy not only helps in relieving retinal traction but also helps by reducing the VEGF load in the vitreous cavity. Posterior vitreous is very adherent to the retina, and no attempt is made to induce posterior vitreous detachment. Gonzales et al. also proposed a modification of the transconjunctival MIVS. Instead of entering transconjunctivally, ports were created after conjunctival peritomy. They hypothesized that since the pars plicata incisions in infants are made more proximal to the limbus, adequate coverage of sclerotomies will not be possible unless sutured at the end of the surgery. Suturing of the sclerotomies may also be necessary because of low scleral rigidity in these premature babies that may not allow self-sealing of the sclerotomies. Since these eyes have small interpalpebral fissure, the use of trocar and cannulas may be difficult. Sclerotomies may need to be placed closer to the horizontal meridian, to allow more room for adequate manipulation of instruments. Furthermore, a 25G MVR blade can be used to make the sclerotomies followed by direct entry with the microvitrectomy cutter or light pipe probe. Improved fluidic mechanisms of the MIVS allow prompt increase in IOP in the event of increased intraoperative bleeding resulting in reduced rates of postoperative vitreous hemorrhage. Choi et al., in their series of Stage 4 and Stage 5 ROP with 20G, reported postoperative intraocular hemorrhage in nearly 43% of cases while Gonzales et al. reported postoperative vitreous hemorrhage in 13.3% of cases after 25G MIVS for Stage 4 and Stage 5 cases. This is the more common presentation of Stage 5 ROP. Due to the peculiar pathoanatomy of these detachments, the principles of vitrectomy that are applicable to other forms of RD cannot be used here. Unlike LSV, the presence of retrolental tissue necessitates the removal of the lens. Furthermore, because the retina is pulled up very anteriorly, sclerotomies are made at 0.5 mm from the limbus either through or just behind the iris root to prevent inadvertent entry into the subretinal space and iatrogenic retinal break formation. Limbal approach for the surgery is also preferred to completely avoid the area of iris root especially in conjunction with the smaller gauge instruments. Kay et al. have used this technique with the cannula in situ. Corneal side-port incision can also be made without the use of the trochar, and cannula system to introduce the 25G instruments directly through the corneal limbal incisions and an AC maintainer can be used in the inferotemporal quadrant. Lensectomy is done using the microvitrectomy cutter to aspirate the lens material under low suction, once the anterior capsule is removed., The posterior capsule is then peeled off gently using end-gripping intraocular forceps., This is followed by cruciate incisions into the RLF to expose the underlying retina [Figure 3]a. The preretinal tissue is removed completely without retinal break formation using 23/25G intraocular forceps and scissors using bimanual dissection under coaxial illumination of the microscope. The dissection is continued until the posterior funnel of RD is opened up with removal of the fibrous stalk from the optic nerve head that holds the retina along the central axis [Figure 3]b and [Figure 3]c. Using the improved fluidics of MIVS, IOP is rapidly increased in case of sudden bleeding and any intraoperative bleeding blood vessels can be coagulated. “Peripheral trough” (formed between the peripheral avascular retina and retinal fold from ridge) is then opened-up all around by careful dissection to remove the fibrous tissue formed between the peripheral-attached avascular retina and the retinal fold from the ridge [Figure 3]d. This is done using the microvit and/or curved scissors under binocular indirect ophthalmic microscope (OCULUS Optikgeräte GmbH, Germany) for wide-angle view intraoperatively. The surgery is completed without any retinal break formation. The retinal break is identified during surgery by the presence of Schlieren [inflow of straw-colored fluid from the subretinal space; [Figure 4]. The use of adrenaline (1:1000 dilution in 0.1 ml or 1:1000,000 in 0.2 ml) in infusion line can help to keep the pupil well dilated., In cases with posterior synechiae, the use of iris retractors is done. The use of MIVS allows the iris to be left undisturbed. After meticulous relief of all traction, the partial fluid gas exchange may be done though not essential. Subretinal fluid (SRF) drainage is not done. These sclerotomies need to be sutured in all cases with 10-0 nylon or 10-0 vicryl. Removal of the preretinal tissue is usually done from the center to the periphery. In a pilot study by Gopal and Sharma, the dissection was initiated from the periphery until the center with good results; however, it may not be possible in all cases. Postoperative complications of surgery include retinal break formation, vitreous hemorrhage, secondary glaucoma, corneal clouding, cataract, strabismus, and phthisis. Most frequently reported complication is that of glaucoma following surgery with incidence up to 33.3%.,,,,,, In one of the recent reports, the risk of postoperative secondary glaucoma was higher in eyes that underwent lensectomy during the surgical procedure. Recurrence of RD has been observed in 22% of cases in Stage 5 as compared to 5% in Stage 4. This highlights the importance of prolonged follow-up of these eyes even after successful reattachment [Figure 5]. The surgical outcomes can be considered for two parameters – anatomical success and functional success. Anatomical success after surgery for Stage 5 ROP has been commonly defined as the attachment of the posterior retina. Generally, the rates of reattachment have been reported as disappointing following surgery for Stage 5 ROP ranging between 13% and 45.5%.,,,,,, Fuchino et al. reported up to 59% anatomical success while Machemer and deJuan in their 121 eyes with Stage 5 ROP reported partial attachment in 40% of the eyes and complete attachment in only 9% of the eyes post-closed vitrectomy. Gopal et al. reported an anatomical success rate of 22.5% with lensectomy and vitrectomy in 96 eyes with Stage 5 ROP and Shah et al. compared the anatomical success rates in Stage 4 and Stage 5 and reported anatomic success after surgery in Stage 5 of 14% as compared to 90% in Stage 4A group. Cusick et al. in their series of 608 eyes with Stage 5 ROP demonstrated a 28% surgical success rate. Lakhanpal et al. reported a success rate of 45.5% after LSV in Stage 5 ROP in 33 eyes. About 63.6% of their eyes were of open-open configuration, thus suggesting that the stage at which surgery is performed is an important prognostic factor. Open-open or partially open funnel configurations have been reported to fare better than closed configuration detachments by other authors too.,,, Gopal et al. attributed the poor anatomical outcome to the presence of a narrow-narrow funnel configuration at the time of surgery in 81.3% of eyes. Choi et al. found a better outcome (44.4%) in open funnel type as compared to closed funnel type (15%) RD. Another factor which has been significantly associated with improved outcomes is age at surgery. Machemer et al. and Cusick et al. had reported a higher success rate when babies were operated after 6 months of age. Gopal et al. and Fuchino et al. have suggested that since the disease is more vascularly active in babies <6 months of age, operating within 6 months has marked risk of postoperative hemorrhages. This can, however, be reduced by preoperative or postoperative use of bevacizumab. Gadkari et al. reported better anatomical results in eyes with minimally fibrotic Stage 5 ROP (those eyes that had a translucent RLF with visibility of the underlying retinal vessels and absence of anteriorly rotated ciliary processes). The presence of iatrogenic breaks intraoperatively has usually resulted in poor results., A study comparing the ocular features with the surgical outcomes has reported the presence of two or more quadrants of plus disease and 6 clock hours of ridge elevation to be associated with persistent RD. Fuchino et al. have compared the retinal attachment rates in patients with shallow and deep ACs and did not find any significant differences. Jabbour et al., however, found anterior-segment features such as anterior and posterior synechiae associated with poor outcome. Form identification was seen in up to 10%–20% of patients.,, Seaber et al. evaluated the long-term visual outcomes in 51 vitrectomized ROP eyes and found that ambulatory vision could be achieved in five eyes and 11 eyes had PL and form identification was present especially if the objects are lit. Similar outcomes were reported by Karacorlu et al. who found that Stage 5 eyes could achieve an average vision of 20/4000. Visual deprivation in early months also may affect the development of cognitive function early on even after successful reattachment. Hence, prolonged efforts for visual development should not be given up too soon. The anatomical and functional outcomes and the complications, following surgery as reported by various authors is summarized in [Table 1]. One of the main causes of poor visual outcome in these eyes is the presence of tough adhesion between the retina and vitreous that does not allow complete separation of the posterior vitreous. Plasmin is known to degrade glycoprotein which is the major adhesive between the cortical vitreous and internal-limiting membrane. Autologous plasmin has been used by surgeons to facilitate complete vitreous separation in Stage 5 ROP., Autologous plasminogen (AP) is purified from the patient's plasma and activated with urokinase. 0.03–0.22 IU of AP in a volume of 0.1–0.15 ml is then injected into the vitreous cavity intraoperatively after removal of the RLF, and further dissection is done after 10–15 min. Tsukahara et al. reported adequate relief of traction in all six cases subjected to this method without an increase in the retinal break formation. Wu et al. have shown improved results with autologous and maternal plasmin in eyes with primary as well as reoperated Stage 5 disease. The use of intravitreal steroids during vitrectomy has been also investigated by Lakhanpal et al. especially in vascularly active eyes with Stage 5 disease. In their series of eyes lensectomy and vitrectomy was performed with intravitreal triamcinolone acetonide (IVTA) in 10 eyes with vascularly active Stage 5 ROP. 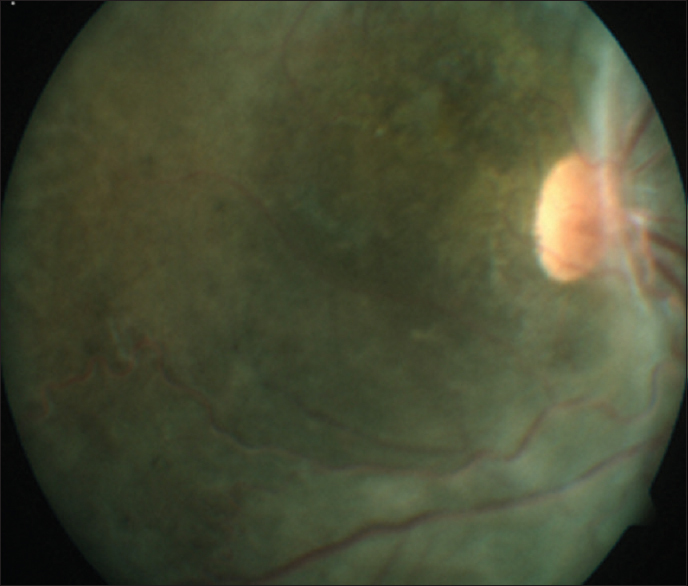 After the closure of sclerotomies, 2.0 mg/0.05 ml of IVTA was injected onto the retinal surface. About 60% eyes (6 out of 10) achieved anatomical success as compared to none in those eyes where IVTA was not used. The authors also observed a rapid resolution of SRF in such cases with no increase in fibrosis. Inhibition of VEGF and deceased vascular permeability secondary to steroids may be the possible underlying mechanisms, although this method has not been vastly used by many surgeons. The variability of presentation and heterogeneous response to treatment has led researchers to look for underlying genetic predisposition for severe ROP. ROP is clinically similar to FEVR except for the history of prematurity. Recent studies suggest a genetic predisposition to ROP in patients who have defect in the Wnt receptor signaling pathway particularly in norrin cystine knot growth factor (NDP) and Frizzled 4 (FZD4) genes similar to the ones seen in FEVR. Genetic variants of FZD4 and low-density lipoprotein receptor-related protein 5 have also been reported in the Japanese population in cases of advanced ROP. Thus, suggesting a role of genetic factors apart from the environmental factors. Recently, a group of authors have identified strong correlation of ROP with newer genes, namely the variants of complement factor H, C-X-C chemokine receptor type 4, Fibulin 5, complement factor B, and cholesteryl ester transfer protein (CETP). Among these CETP was found to be a risk factor, and others were protective indicating the involvement of complement pathway. There is a growing need to create ROP awareness among the parents and healthcare providers. It is important for pediatricians, neonatologists, obstetricians, and ophthalmologists to make sure screening, follow-up, and timely intervention for ROP is done. Although few severe cases may progress to Stage 5 ROP even after regular screening examinations and laser treatment, not initiating ROP screening is considered a case of negligence. It is important for NICU's to have a screening system in place that ensures that the babies receive timely examinations and follow-up treatment when required. Protocols should include notifying parents, guardians, hospitals, and pediatricians when a baby fails to be brought in for an appointment. RetCam (Clarity Medical Systems, Pleasanton, CA) imaging can be helpful in documenting ROP. Our understanding of the pathogenesis and surgical management of Stage 5 ROP has come a long way. Surgery for Stage 5 has shown anatomic reattachment in 20%–50% of cases. Even though the measurable visual acuity may remain poor, the parents of these children do report some useful vision which continues to slowly improve. This vision can make a world of difference to a blind child. Furthermore, an anatomically attached retina always gives the hope of some future viable option-like gene therapy, stem cells, or retinal prosthesis. Till definite steps are taken to bring all preterm babies into the network of screening and timely treatment, surgery for Stage 5 ROP is here to stay. This is the only hope for these children. The most important aspect of the treatment for Stage 5 ROP is the education of parents regarding the limited visual outcomes that may benefit a small proportion of eyes undergoing surgery and need for prolonged follow-up. The authors would like to acknowledge Dr. Parthopratim Dutta Majumdar for his contribution to the schematic diagram. The authors declare that there are no conflicts of interests of this paper. Terry TL. 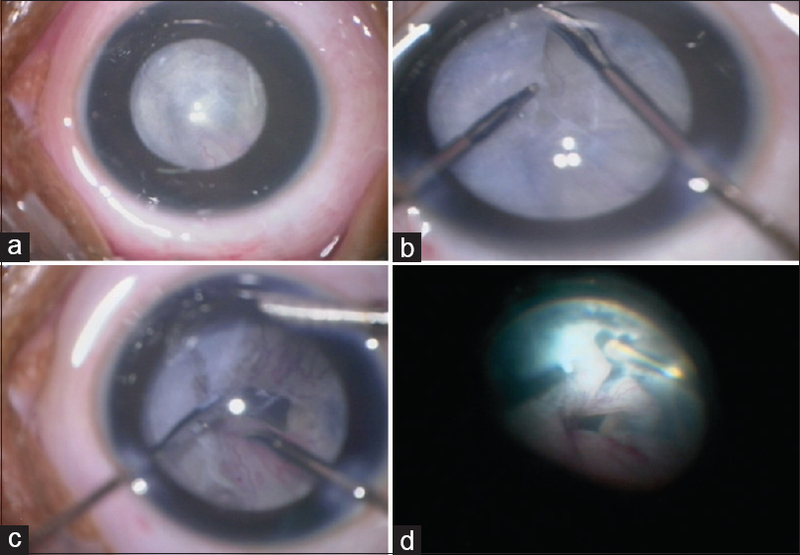 Extreme prematurity and fibroblastic overgrowth of persistent vascular sheath behind each crystalline lens. Am J Ophthalmol 1942;25:203-4. Campbell K. Intensive oxygen therapy as a possible cause of retrolental fibroplasia; a clinical approach. Med J Aust 1951;2:48-50. Courtright P, Hutchinson AK, Lewallen S. Visual impairment in children in middle- and lower-income countries. Arch Dis Child 2011;96:1129-34. Gilbert C, Foster A. Childhood blindness in the context of VISION 2020 – the right to sight. Bull World Health Organ 2001;79:227-32. An international classification of retinopathy of prematurity. The Committee for the Classification of Retinopathy of Prematurity. Arch Ophthalmol 1984;102:1130-4. Gilbert C. Retinopathy of prematurity: A global perspective of the epidemics, population of babies at risk and implications for control. Early Hum Dev 2008;84:77-82. Blencowe H, Lawn JE, Vazquez T, Fielder A, Gilbert C. Preterm-associated visual impairment and estimates of retinopathy of prematurity at regional and global levels for 2010. Pediatr Res 2013;74 Suppl 1:35-49. Solebo AL, Teoh L, Rahi J. Epidemiology of blindness in children. Arch Dis Child 2017;102:853-7. Blencowe H, Moxon S, Gilbert C. Update on blindness due to retinopathy of prematurity globally and in India. Indian Pediatr 2016;53 Suppl 2:S89-92. Sanghi G, Dogra MR, Katoch D, Gupta A. Demographic profile of infants with stage 5 retinopathy of prematurity in North India: Implications for screening. Ophthalmic Epidemiol 2011;18:72-4. Hornby SJ, Xiao Y, Gilbert CE, Foster A, Wang X, Liang X, et al. Causes of childhood blindness in the people's republic of china: Results from 1131 blind school students in 18 provinces. Br J Ophthalmol 1999;83:929-32. Chang KM, Patel DK, Tajunisah I, Subrayan V. The trend of retinopathy of prematurity in Malaysia from 1992 to 2001 based on a nationwide blind schools study. Asia Pac J Public Health 2015;27:217-24. Li ML, Hsu SM, Chang YS, Shih MH, Lin YC, Lin CH, et al. Retinopathy of prematurity in Southern Taiwan: A 10-year tertiary medical center study. J Formos Med Assoc 2013;112:445-53. Seiberth V, Linderkamp O. Risk factors in retinopathy of prematurity. A multivariate statistical analysis. Ophthalmologica 2000;214:131-5. Karna P, Muttineni J, Angell L, Karmaus W. Retinopathy of prematurity and risk factors: A prospective cohort study. BMC Pediatr 2005;5:18. Chen M, Citil A, McCabe F, Leicht KM, Fiascone J, Dammann CE, et al. Infection, oxygen, and immaturity: Interacting risk factors for retinopathy of prematurity. Neonatology 2011;99:125-32. Akkoyun I, Oto S, Yilmaz G, Gurakan B, Tarcan A, Anuk D, et al. Risk factors in the development of mild and severe retinopathy of prematurity. J AAPOS 2006;10:449-53. Chen ML, Guo L, Smith LE, Dammann CE, Dammann O. High or low oxygen saturation and severe retinopathy of prematurity: A meta-analysis. Pediatrics 2010;125:e1483-92. Supplemental therapeutic oxygen for prethreshold retinopathy of prematurity (STOP-ROP), a randomized, controlled trial. I: Primary outcomes. Pediatrics 2000;105:295-310. Garcia-Serrano JL, Uberos Fernández J, Anaya-Alaminos R, Jerez-Calero A, Padilla-Torres JF, Ramírez-Garcia MC, et al. “ Oxygen with love” and diode laser treatment decreases comorbidity and avoidable blindness due to retinopathy of prematurity: Results achieved in the past 12 years. Pediatr Neonatol 2013;54:397-401. Hittner HA. Retinal development and the pathophysiology of retinopathy of prematurity. In: Pollin RA, Fox WW, Abman SH, editors. Fetal and Neonatal Physiology. Vol. 2. Philadelphia: Saunders; 2011. p. 1875-81. Hughes S, Yang H, Chan-Ling T. Vascularization of the human fetal retina: Roles of vasculogenesis and angiogenesis. Invest Ophthalmol Vis Sci 2000;41:1217-28. Hartnett ME. Studies on the pathogenesis of avascular retina and neovascularization into the vitreous in peripheral severe retinopathy of prematurity (an American Ophthalmological Society Thesis). Trans Am Ophthalmol Soc 2010;108:96-119. Smith LE. Pathogenesis of retinopathy of prematurity. Semin Neonatol 2003;8:469-73. Quimson SK. Retinopathy of prematurity: Pathogenesis and current treatment options. Neonatal Netw 2015;34:284-7. Kwinta P, Bik-Multanowski M, Mitkowska Z, Tomasik T, Pietrzyk JJ. The clinical role of vascular endothelial growth factor (VEGF) system in the pathogenesis of retinopathy of prematurity. Graefes Arch Clin Exp Ophthalmol 2008;246:1467-75. Foos RY. Retinopathy of prematurity. Pathologic correlation of clinical stages. Retina 1987;7:260-76.
de Juan E, Gritz DC, Machemer R. Ultrastructural characteristics of proliferative tissue in retinopathy of prematurity. Am J Ophthalmol 1987;104:149-56. Machemer R. Description and pathogenesis of late stages of retinopathy of prematurity. Ophthalmology 1985;92:1000-4. Machemer R, deJuan E. Retinopathy of prematurity: Approaches to surgical therapy. Aust N Z J Ophthalmol 1990;18:47-56. Clarkson JG, Jacobson SG, Frazier-Byrne S, Flynn JT. Evaluation of eyes with stage-5 retinopathy of prematurity. Graefes Arch Clin Exp Ophthalmol 1989;227:332-4. Ekert PG, Keenan NK, Whyte HE, Boulton J, Taylor MJ. Visual evoked potentials for prediction of neurodevelopmental outcome in preterm infants. Biol Neonate 1997;71:148-55. Jabbour NM, Eller AE, Hirose T, Schepens CL, Liberfarb R. Stage 5 retinopathy of prematurity. Prognostic value of morphologic findings. Ophthalmology 1987;94:1640-6. Gadkari SS, Deshpande M, Kulkarni S. Minimally fibrotic stage 5 ROP: A clinical prognostic factor in eyes undergoing vitrectomy for stage 5 retinopathy of prematurity. Graefes Arch Clin Exp Ophthalmol 2016;254:1303-9. Pulido JS, Byrne SF, Clarkson JG, Di Bernardo CL, Howe CA. Evaluation of eyes with advanced stages of retinopathy of prematurity using standardized echography. Ophthalmology 1991;98:1099-104. Muslubas IS, Karacorlu M, Hocaoglu M, Yamanel C, Arf S, Ozdemir H, et al. Ultrasonography findings in eyes with stage 5 retinopathy of prematurity. Ophthalmic Surg Lasers Imaging Retina 2015;46:1035-40. Gopal L, Sharma T, Shanmugam M, Badrinath SS, Sharma A, Agraharam SG, et al. Surgery for stage 5 retinopathy of prematurity: The learning curve and evolving technique. Indian J Ophthalmol 2000;48:101-6. Maidana EJ, Matieli LC, Allemann N, Melo LA Jr., Morales M, Moraes NS, et al. Ultrasonographic findings in eyes with retinal detachments secondary to retinopathy of prematurity. J Pediatr Ophthalmol Strabismus 2007;44:39-42. Tamburrelli C, Ricci B, Dicembrino M, Santo A. An ultrasonographic study of stage-5 retinopathy of prematurity. Ophthalmologica 1998;212:381-8.
de Juan E Jr., Shields S, Machemer R. The role of ultrasound in the management of retinopathy of prematurity. Ophthalmology 1988;95:884-8. Treister G, Machemer R. Results of vitrectomy for rare proliferative and hemorrhagic diseases. Am J Ophthalmol 1977;84:394-412. Greven C, Tasman W. Scleral buckling in stages 4B and 5 retinopathy of prematurity. Ophthalmology 1990;97:817-20. Trese MT. Scleral buckling for retinopathy of prematurity. Ophthalmology 1994;101:23-6. Hirose T, Katsumi O, Mehta MC, Schepens CL. Vision in stage 5 retinopathy of prematurity after retinal reattachment by open-sky vitrectomy. Arch Ophthalmol 1993;111:345-9. Tasman W, Borrone RN, Bolling J. Open sky vitrectomy for total retinal detachment in retinopathy of prematurity. Ophthalmology 1987;94:449-52. Trese MT, Capone A. Surgical approaches to infant and childhood retinal diseases: Invasive methods. In: Hartnett ME, Trese M, Capone A, editors. Pediatric Retina. Philadelphia: Lippincott; 2005. p. 359-64. Hairston RJ, Maguire AM, Vitale S, Green WR. Morphometric analysis of pars plana development in humans. Retina 1997;17:135-8. Shah PK, Narendran V, Kalpana N, Tawansy KA. Anatomical and visual outcome of stages 4 and 5 retinopathy of prematurity. Eye (Lond) 2009;23:176-80. Fujii GY, De Juan E Jr., Humayun MS, Chang TS, Pieramici DJ, Barnes A, et al. 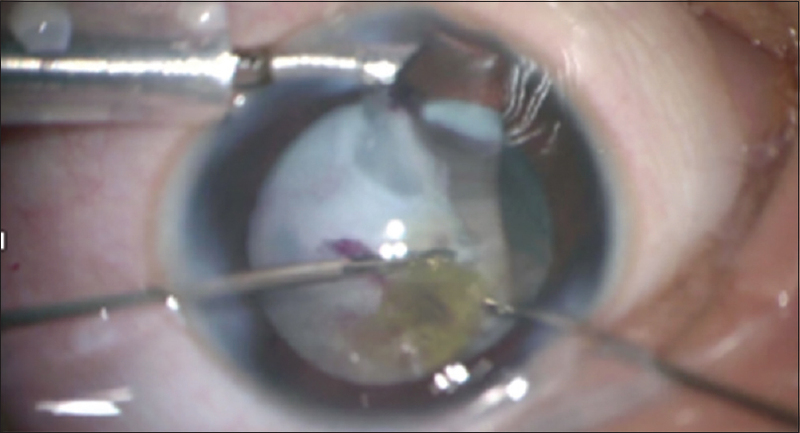 Initial experience using the transconjunctival sutureless vitrectomy system for vitreoretinal surgery. Ophthalmology 2002;109:1814-20. Gonzales CR, Boshra J, Schwartz SD 25-gauge pars plicata vitrectomy for stage 4 and 5 retinopathy of prematurity. Retina 2006;26:S42-6. Choi J, Kim JH, Kim SJ, Yu YS. Long-term results of lens-sparing vitrectomy for stages 4B and 5 retinopathy of prematurity. Korean J Ophthalmol 2011;25:305-10. Kay CN, Quiram PH, Mahajan VB 23-gauge pediatric vitrectomy using limbus-based trocar-cannulas. Retina 2012;32:1023-7. Gopal L, Sharma T. Periphery to centre dissection for stage V retinopathy of prematurity aided by temporary iris retractors – A pilot study. Hong Kong J Ophthalmol 1997;1:41-4. Hartnett ME. Features associated with surgical outcome in patients with stages 4 and 5 retinopathy of prematurity. Retina 2003;23:322-9. Yu YS, Kim SJ, Kim SY, Choung HK, Park GH, Heo JW, et al. Lens-sparing vitrectomy for stage 4 and stage 5 retinopathy of prematurity. Korean J Ophthalmol 2006;20:113-7. Seaber JH, Machemer R, Eliott D, Buckley EG, deJuan E, Martin DF, et al. Long-term visual results of children after initially successful vitrectomy for stage V retinopathy of prematurity. Ophthalmology 1995;102:199-204. Karacorlu M, Hocaoglu M, Sayman Muslubas I, Arf S. Long-term functional results following vitrectomy for advanced retinopathy of prematurity. Br J Ophthalmol 2017;101:730-4. Nudleman E, Muftuoglu IK, Gaber R, Robinson J, Drenser K, Capone A, et al. Glaucoma after lens-sparing vitrectomy for advanced retinopathy of prematurity. Ophthalmology 2018;125:671-5. Kondo H, Arita N, Osato M, Hayashi H, Oshima K, Uchio E, et al. Late recurrence of retinal detachment following successful vitreous surgery for stages 4B and 5 retinopathy of prematurity. Am J Ophthalmol 2009;147:661-60. Lakhanpal RR, Sun RL, Albini TA, Holz ER. Anatomical success rate after primary three-port lens-sparing vitrectomy in stage 5 retinopathy of prematurity. Retina 2006;26:724-8. Cusick M, Charles MK, Agrón E, Sangiovanni JP, Ferris FL 3rd, Charles S, et al. Anatomical and visual results of vitreoretinal surgery for stage 5 retinopathy of prematurity. Retina 2006;26:729-35. Fuchino Y, Hayashi H, Kono T, Ohshima K. Long-term follow up of visual acuity in eyes with stage 5 retinopathy of prematurity after closed vitrectomy. Am J Ophthalmol 1995;120:308-16. Choi WC, Yu YS. Surgical management for stage 5 retinopathy of prematurity. Korean J Ophthalmol 1994;8:37-41. Kychenthal A, Dorta P. Vitrectomy after intravitreal bevacizumab (Avastin) for retinal detachment in retinopathy of prematurity. Retina 2010;30:S32-6. Wu WC, Drenser KA, Lai M, Capone A, Trese MT. Plasmin enzyme-assisted vitrectomy for primary and reoperated eyes with stage 5 retinopathy of prematurity. Retina 2008;28:S75-80. Trese MT. Visual results and prognostic factors for vision following surgery for stage V retinopathy of prematurity. Ophthalmology 1986;93:574-9. Mintz-Hittner HA, O'Malley RE, Kretzer FL. Long-term form identification vision after early, closed, lensectomy-vitrectomy for stage 5 retinopathy of prematurity. Ophthalmology 1997;104:454-9. Uemura A, Nakamura M, Kachi S, Nishizawa Y, Asami T, Miyake Y, et al. Effect of plasmin on laminin and fibronectin during plasmin-assisted vitrectomy. Arch Ophthalmol 2005;123:209-13. Tsukahara Y, Honda S, Imai H, Kondo N, Fujii S, Yokoyama N, et al. Autologous plasmin-assisted vitrectomy for stage 5 retinopathy of prematurity: A preliminary trial. Am J Ophthalmol 2007;144:139-41. Lakhanpal RR, Fortun JA, Chan-Kai B, Holz ER. Lensectomy and vitrectomy with and without intravitreal triamcinolone acetonide for vascularly active stage 5 retinal detachments in retinopathy of prematurity. Retina 2006;26:736-40. Hiraoka M, Takahashi H, Orimo H, Hiraoka M, Ogata T, Azuma N, et al. Genetic screening of wnt signaling factors in advanced retinopathy of prematurity. Mol Vis 2010;16:2572-7. Kondo H, Kusaka S, Yoshinaga A, Uchio E, Tawara A, Tahira T, et al. 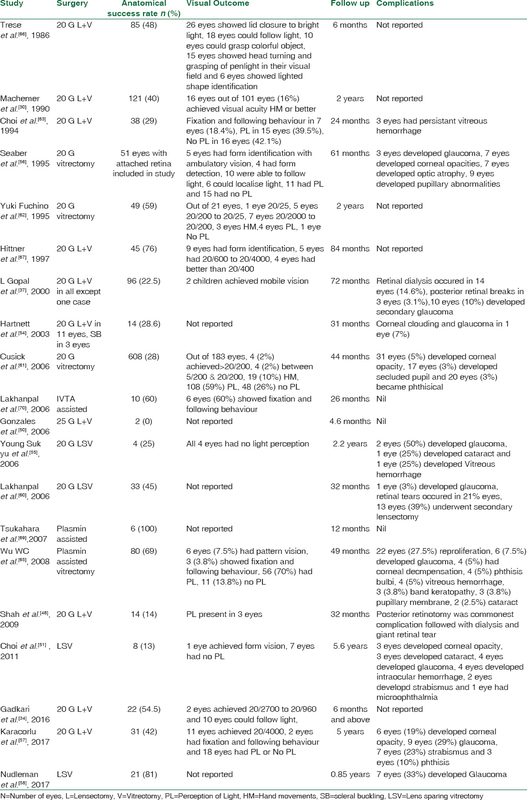 Genetic variants of FZD4 and LRP5 genes in patients with advanced retinopathy of prematurity. Mol Vis 2013;19:476-85. Rathi S, Jalali S, Patnaik S, Shahulhameed S, Musada GR, Balakrishnan D, et al. Abnormal complement activation and inflammation in the pathogenesis of retinopathy of prematurity. Front Immunol 2017;8:1868.